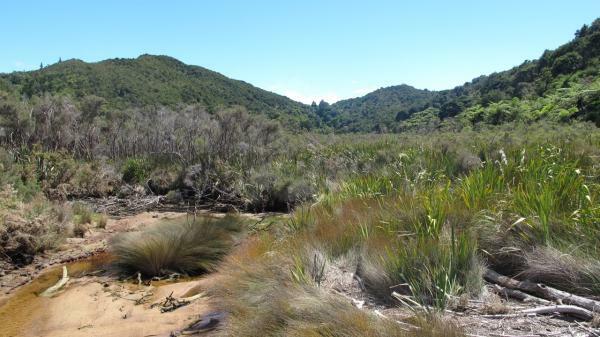 Richardson Stream flows from the Tonga Saddle, south of Awaroa, to the sea at the northern end of Onetahuti beach. It follows a faultline, one of the only faults mapped in the eastern part of the park. 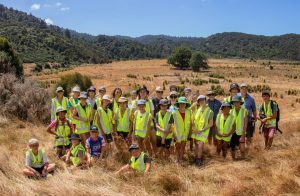 The upper reaches of the stream follow a deep ravine that is filled with a significant patch of original forest including very large rata, rimu and pupate. The lower stream flows through a large wetland formed by the infilling of the depression caused by the faultline. You get a good view of the wetland from the boardwalk and bridge at Onetahuti. So how did this unique and important little stream obtain its name? Ralph Richardson was the son of an English aristocrat, Richard Richardson, of Capenhurst, Cheshire. Ralph graduated from Edinburgh University (MD) and Cambridge (MA) where he was elected a member of the governing body. He married into the Seymour family that included former Queens of England and he and Marie migrated to Nelson in 1851. Together they brought considerable resources and political power with them. 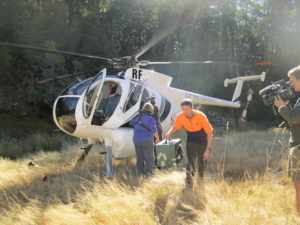 Ralph briefly became a member of the Legislative Council, and they purchased land in Nelson (the Maitai Run), Marlborough (Meadowbank Station) and land in the now Abel Tasman National Park. This included Tonga Island and the adjacent mainland to the south of Awaroa Inlet, fronting onto Shag Harbour. The Richardsons returned to England after only 10 years in New Zealand but their son Ralph stayed on and managed the Maitai Run. Ralph and his wife Effie had two daughters, one named Raphine Zealandia Regina, affectionately known as “Queenie”. The sudden death of Ralph in 1889 caused the family to return to Europe, Queenie living mainly in France for 17 years, living on the earnings from the Nelson properties. Upon return, in 1908, Queenie lived with her notorious mother on the Maitai Run, dealing fastidiously with land issues and running the farm. Queenie became a major figure in Nelson society. She held regular French speaking ‘salons’ attended by her close friend Perrine Moncrieff. 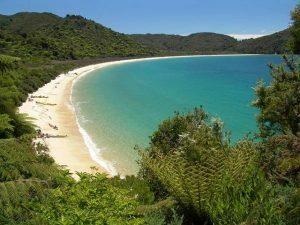 There is little doubt that the friendship included discussion of the proposed Abel Tasman National Park and lubricated the sale and transfer of the Richardson lands to the Park.